As for the wind turbines, apparently an elongated Savonius design, they might work, but sandwiched between the floors as they are, probably not all that well, as the boundary layer of the floors would deflect much of the wind's force. The claim that it would generate 10 times the energy that the building uses is very hard to take seriously, especially in the desert. Buildings with rotating components have, of course, been built before. Seattle's Space Needle is one of many structures to have a rotating restaurant. There is even an appartment building in Brazil where each floor is an appertment that can rotate. The architect, David Fischer, admits he has never attempted anything remotely as ambitious before. Fisher acknowledges that he is not well known, has never built a skyscraper before and hasn't practiced architecture regularly in decades. But he insisted his lack of experience wouldn't stop him from completing the project, which has attracted top design talent, including Leslie E. Robertson, the structural engineer for the World Trade Center and the Shanghai World Financial Center. 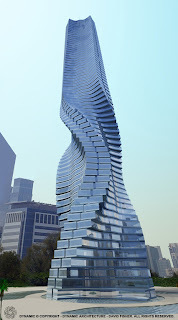 "I did not design skyscrapers, but I feel ready to do so," Fisher said. He has also embellished his credentials. In a biography he ... also said he received an honorary doctorate from "The Prodeo Institute at Columbia University in New York." No such institution exists, however, and Columbia said it had never awarded Fisher an honorary degree. Pretty idea, pretty website, but most of the spin is in the story.